The phrase "at large" is only used when describing criminals who aren't caught yet. I guess it's because when they're caught, they're "in small". ? I don't know. Newscasters pronounce "details" as deTAILS, whilst us commoners say DEtails. Annoying. 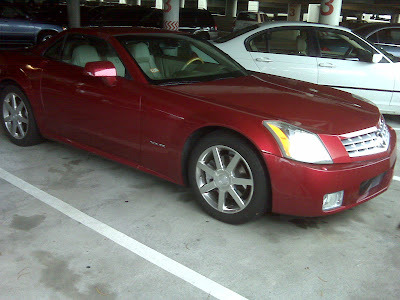 This is a pic of one of the cars I will buy when I win the lotto. I play twice a week in the office pool. 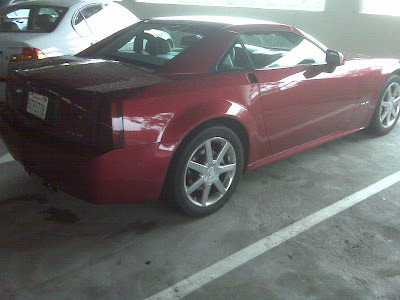 It's a Cadillac XLR Roadster. It has a retractable roof and a Corvette engine in it. It's kickass. I blow kisses at my new roof these days as I leave for work in the morning. The amount of rain we're having is stunning. Of course we're going through another El Nino cycle, I just got solar panels. Moxie, who turned 12 two days ago, and I went for a run in tonight's downpour. We were drenched by block two. We're both squeaky clean and ready for bed now. Yay tomorrow is Friday.